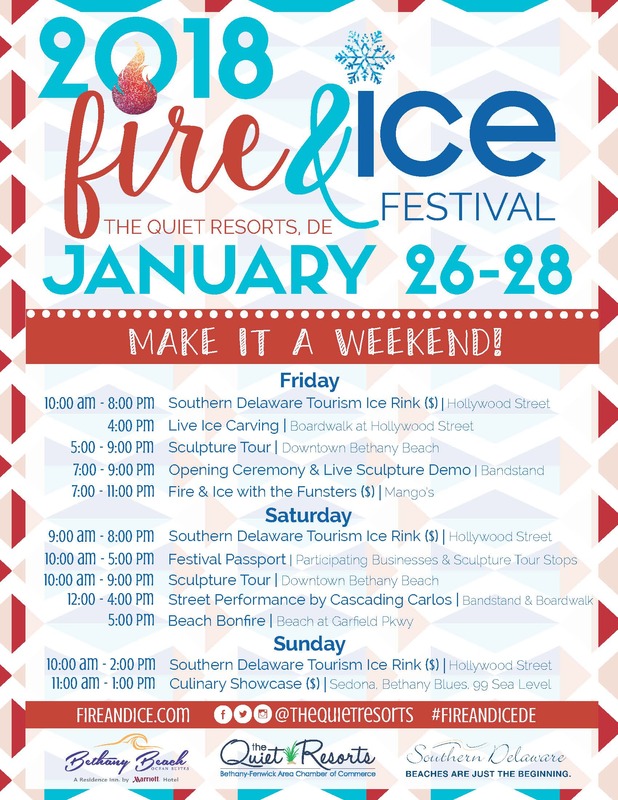 Experience the Quiet Resorts as you have never experienced them before at the Inaugural Fire & Ice Festival in downtown Bethany Beach! Trade your beach cruiser for your ice skates for a family-friendly weekend full of winter festivities, including an ice sculpture tour and live sculpture demonstration featuring the work of local sculptor Erik Cantine (Berlin,MD), ice skating rink, and — of course — a seasonal stop at your favorite shops, restaurants, and businesses. Festival is free to the public. All Friday and Saturday ice rink proceeds will benefit Believe In Tomorrow. The ice rink will be open 10 am to 8 pm on Friday and 9 am to 8 pm on Saturday.